The best way to obtain a control system custom-tailored to your mixing equipment, and ensure a smooth start-up, is to buy your control system and mixing equipment from the same manufacturer. No other company in the world can match Ross’s experience in both specialty mixing and controls. SysCon, our control systems division can provide a comprehensive package of control design, manufacturing and support for virtually any production environment. SysCon offers a selection of PLC/PCbased controls with many options for integration into your existing production network. We can also provide cost-effective strategies for stand-alone installations. The Ross EasyLog™ system, for example,logs performance data and allows you to download or display trends in real time – without the need for chart recorder. When using Ross mixers or blenders, process flexibility relies on your ability to control agitator speeds and cycle times. 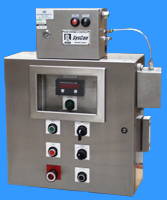 A multi-axis control system can store many product recipes for fast changeover. It also allows you to revise product recipes off-line and implement process improvements at any time. By reducing operator contact with the equipment and the materials being mixed, the control system can also significantly improve plant safety. The control is best designed by the mixer manufacturer, since the logic for operation (and especially for safety) has already been developed. There is no need to start from scratch. 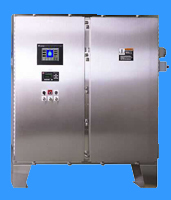 The mixing control system should be designed to handle your present pharmaceutical mixing operation and provide ample of room for growth. It must interface with your present manufacturing information network as well as your future network. Allowing room for process evolution - anticipating expansion and process refinements that may be unclear now - is essential in building long-term value into your control system.